Hi, my name is Nick and I'm in charge of animation for the game. This post is going to describe the tools we're using and our general approach to producing animation for Damsel. It was decided early on that we would use puppet style animation for the characters rather than hand drawn animation. The advantages of puppet animation were too great. It meant we could reuse rigs to have one animation shared by various characters. And it also let us easily customize or edit the look of both the character art and the animation itself. Puppet isn't without it's limitations however. Unlike 3D or hand drawn animation, you can't easily communicate foreshortening. Puppet uses a collection of static images that all exist on the same plane, so if you want something to appear to have depth, you have to redraw it at a different angle. It's my job to work within these limitations and have the animation be the best it possibly can be. The process of creating an animation in this way comes with a fair amount of individual steps. Here I'll describe them in order and mention the sorts of things that are considered at each stage. After having an action and it's purpose described to me by the game designer, I start exploring potential ways to communicate it as an animation. The purpose of this stage is to solidify any aspects of an idea that are unclear and make sure that they work practically with the planned game mechanic. Most of my work here is producing quick sketches of key poses, so that the final animation appears clear and easily understood by the player. Once I have a better idea of what the final animation will look like, I start creating the individual pieces that make up the character. This stage is much more involved that it appears. 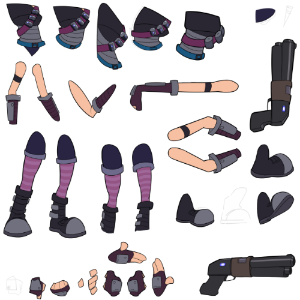 The character pieces need to be designed with puppet animation in mind, so you need to pay careful attention to the characters joints, as every piece will be pivoting from a certain point. Pieces that require more extreme movement need to look right at any angle, and also need to be designed to seamlessly connect with other pieces while they do. A technique I use is to include cuffs or bands near joints so that the seams are covered during movement. Designing the characters with thinner limbs also helps to make seams less obvious. Next I place all the pieces I created into the game engine. I create flat 3D meshes for the pieces so that they can deform and appear more like flesh around the joints. I compile them all together and then create the rig, which acts like a virtual skeleton that controls and the pieces and allows them to be articulated into various poses. At this point it becomes clear why this technique is called Puppet animation. The moment of truth. Once you start animating the character, it becomes clear whether or not your design and pre-planning has worked. Since there's a lot going on during this stage I'll go more in depth about the animation process in a later blog post. Can you talk about the tools ? Do you use Blender or other 2D tool to animated it , and when you finish how you will send it to Unity, as a FBX file ? We do all our animation inside Unity using the Puppet2D plugin. Our parts are created in flash initially as it's easier to make fixes to vectors. Nick will animate with outlined pieces only, then once we're happy with the animation, we'll go back and color the pieces in (usually in Photoshop). We're going to go into a bit more detail in future posts though, we aim to have a specific animation post once every two weeks or so from now on.